As the term says, a single individual owns and operates this type of business for this type of trade license registration in Dubai 100% ownership and control are given to the individual to operate and keep profits. He could also be held accountable for all the debts and liabilities of the company. UAE or GCC nationals are only allowed to own industrial or commercial type of these businesses. Any consultancy activity engaged by the owner of Sole Proprietorship requires such scientific qualification. Sole Proprietorship Professional licenses can be owned by any national. If he/she is a non-GCC national, a Local Service Agent is required. Corporates cannot hold these companies. 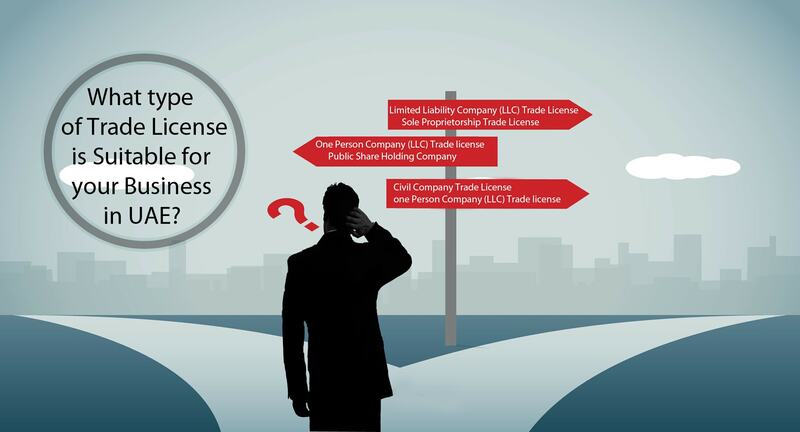 The trade license registered for a One Person Company (LLC) can be owned by a single person or a corporate body. Although similar to Sole Proprietorship, the liability is limited to a single owner’s share. Only a local / GCC national / decree-holder (acc. to the procedures) or a corporate body can own a One Person Company (LLC). It is mandatory to have a minimum of 1-11 managers on the trade license in Dubai. The Memorandum of Association determines the Capital of the Company. Civil Companies are for professionals like accountants, doctors, engineers, and lawyers who enter into a business partnership. Partners can be of any nationality is permitted to practice professional activities keeping up with DED business guidelines. Non GCC owners would require a Local Service Agent to register their trade license in Dubai. An Engineering Civil Company must have a UAE National as a partner who owns at least 51% of the business and an Engineer by profession and practicing same as the activity. A Civil Company having consulting activity must have professional partners of the same business activity as 100% owners. According to DED laws, only one manager can be appointed. The Memorandum of Association should not specify the Capital for the company. The Business name on the trade license certificate should be in accordance with the commercial activity of the firm. An LLC company is one of the most familiar types of company formation in the UAE. Shareholders under this type vary from 2-50 persons. Liabilities are limited to each person’s share in the company. LLC’s can be transformed into any other legal form except for public sharing company. These types of businesses are permitted to practice any commercial, industrial, professional or tourism-related activities. 100% ownership allowed for GCC Nationals and at least 51% for UAE Nationals. Any expat can own LLC as a partner to the UAE National keeping up with DED regulations. Private Share Holding Company is also known as Private Joint-Stock Company is formed by a partnership of 2-200 individuals. An investment of a minimum of AED 5 million is required by the partners. A PJSC can be owned by partners of any nationality in accordance with DED business laws. At least 51% ownership is mandatory for UAE Nationals and 100% ownership available for GCC nationals. Any commercial or industrial type of business can be carried out by a Private Share Holding Company. Professional activities are not permitted under this legal form. In a Public Share Holding Company, the share capital is transferrable and divided into equal values. At least 5 founding members should be UAE Nationals having ownership of 30% to 70% of capital shares. It is mandatory to have a maximum of 5 appointed managers. Any industrial, commercial or professional business activities as per DED regulations are permitted under this legal form. Ownership is not restricted to any nationality or corporate body. Public Share Holding Company can sell and waive branches to any party or company. The owners are also permitted to change its legal form according to DED procedures. Simple Limited Partnership companies are formed by a partnership of a minimum of 2 partners – one general partner and one limited partner. General partners are liable to the extent of their personal and business assets for the company’s liabilities whereas limited partners are only liable to the extent of their share of business capital. This type of company can only conduct commercial and industrial activities. UAE Nationals must be the general partners, and foreign nationals can be limited partners. There is no limit on the ownership of shares between the partners. Limited partners cannot intervene in the management or administrative issues related to other partners; by doing so, they would be held responsible for all the business obligations. A single business where two or more people share ownership and every partner exercises rights towards all aspects of the business and administration unless otherwise agreed upon by a contract. Partnership companies are 100% owned by UAE nationals and cannot be owned by other nationalities even of GCC countries and corporate bodies. Commercial and industrial activities are only permitted for such companies. The owners are jointly and individually responsible for the company’s liabilities. Only one manager is allowed according to DED business regulations. Partnership Company can sell and waive branches to any party or company. The owners are also permitted to change its legal form according to DED procedures. The Parent Company holds 100% ownership of the branch and has to operate under the same name and perform the same activities as the parent company. It requires a Local Service Agent (LSA) which can be a UAE national or a company owned by one or more UAE Nationals. Such companies are allowed to engage in professional activities and some commercial and industrial activities. Authorization is required from the Ministry of Economy for practicing commercial and industrial activities in order to obtain a trade license. Representative Offices are not permitted to carry out business operations but exist to promote and market the parent company’s products and services. It requires a Local Service Agent (LSA) who can be a UAE National or a company owned by one or more UAE Nationals. The LSA provides services necessary for the company and bears no financial liabilities or obligations of the Company or any of its branches. A Branch of a UAE-based Company is fully owned by the parent company and undertakes one or more of the activities listed in the main license. If a company has several branches, each branch can opt for different activities provided they are enlisted in the main license of the company. It is required for the branch to have a name identical to the parent company. However, if the name of the parent company has been previously registered in Dubai, then the parent company must change its name. A Branch of a GCC-based Company is fully owned by the parent company and undertakes one or more of the activities listed in the main trade license. If a company has several branches, each branch can opt for different activities provided they are enlisted in the main trade license of the company. As GCC countries follow different rules regarding combining activities under business licenses, only activities under the same category in Dubai will be accepted even though it is included in the main trade license of the company. It is required for the branch to have a name identical to the parent company. However, if the name of the parent company has been previously registered in Dubai, then the parent company must change its name. Freezone Companies in the UAE are permitted to expand business operations to the mainland if the activity they engage in is authorized in the mainland. The freezone company can open a branch in mainland only if there is a Local shareholder who owns more than 51% in the main company. Otherwise, an approval from Ministry of Economy and a Local Service Agent is required. If GCC nationals own 100% of the freezone company, no LSA is required. An Intelaq License can only be obtained by UAE Nationals. This type of trade license is issued for home-based companies and can be for any professional, trade or artisan business. It must be rational for operations in residential areas. There must be no ecological harm, health hazard or noise that may cause disturbance to neighbors. It can be a Sole Establishment, LLC, Civil Company and Partnership. Such licenses cannot have employees under them or hire external staff but may deal with contractors. Only one license is permitted for an Intelaq, license holder. The trade License for SME is granted to businesses with 100% UAE National ownership and can be of any legal form. The registered trade license is valid for 3 years, and the owner may sponsor employees. No foreign ownership is allowed.